I'm bringing you a make today which I did a couple of months ago on a crafty retreat, I photographed it all ready to post and then forgot all about it! I used Doodlebug Christmas papers from last year, A Purple Onion Owl, A Mama Elephant Tag and a Lawnfawn alpha. Another mishmash of companies but I like to try and make the most of what I have. Posting this card has reminded me I really must get out my distress markers again! I absolutely love your card and the adorable design! The little owl is so cute and I love the cut out letters! I hope you have a wonderful Thanksgiving! So very cute! 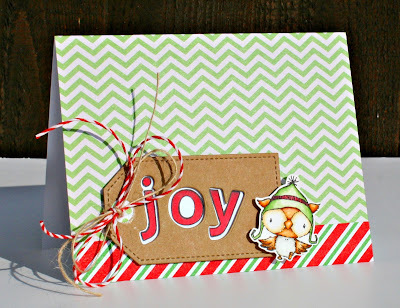 Very much love the chevron and that little owl is so cute! October Card Chain Challenge Reveal!